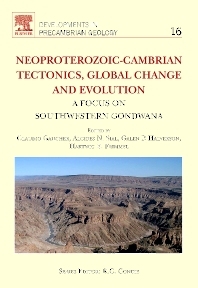 The book deals with the record of important Neoproterozoic to Early Palaeozoic events in southwestern Gondwana, that heralded the Cambrian explosion and the dawn of modern ecosystems. It contains a detailed account of the Neoproterozoic to Cambrian geological record in a poorly-known part of the world, which is at the same time key to understand fundamental processes at the Proterozoic-Cambrian transition. The emphasis is placed on litho-, bio-, chemostratigraphy and magmatism. The palaeoclimatic, tectonic, evolutionary radiation and extinction events and associated mineralizations will be identified and discussed. A synthesis of all data is provided at the end of the book, integrating the data from all cratons and fold belts in southwestern Gondwana. The events will be individualized, their impact discussed and correlations between different successions both within and outside Gondwana proposed. The book is organized in three sections. Section one is an introduction to the neoproterozoic and Cambrian seen as a time of upheavals, extremes and innovations. Section two comprises nineteen chapters dealing with the neoproterozoic-Cambrian events in southwestern Gondwana. Section three will provide a synthesis on every major topic, and a critical assessment of the global implications of the presented data. The book deals with the record of important Neoproterozoic to Early Palaeozoic events in southwestern Gondwana, that heralded the Cambrian explosion and the dawn of modern ecosystems. It contains a detailed account of the Neoproterozoic to Cambrian geological record in a poorly-known part of the world, which is at the same time key to understand fundamental processes at the Proterozoic-Cambrian transition. The emphasis is placed on litho-, bio-, chemostratigraphy and magmatism. Researchers and advanced undergraduate and graduate students in geology, Precambrian geology, tectonics, geochemistry and petrology, geochronology, and economic geology.